Scan size up to 11" x 14"
Compatible with eClipseWriter Pro, the HoverCam from IRTI (Innovation Rehabilitation Technology) provides fast high quality scanning of books and documents up to 11 x 14 inches. 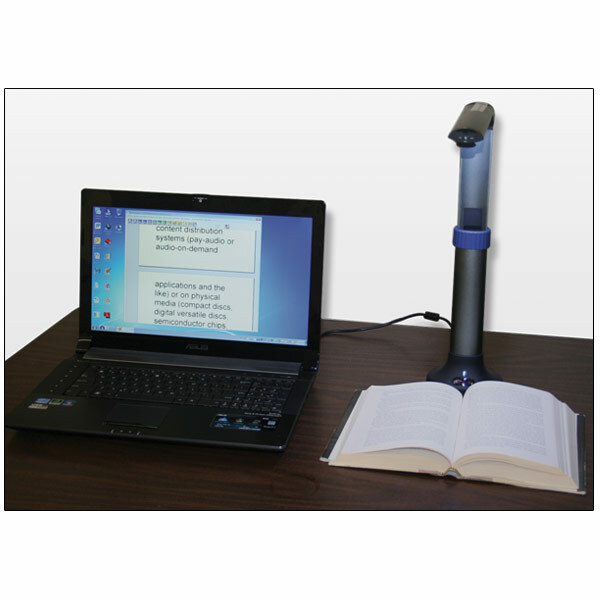 This portable camera can scan two pages of a full size text book with a single click. - Special focusing adjustment to ensure acquisition of a clear picture at fully extended camera position and even within a 6" retractable range. - The depth of field of this camera accommodates uneven surfaces making it an adaptive device for visually impaired customers to use anytime anywhere. - Braille enabled positioning mat, making it easier for the user to position the camera and the document. - Special Anchoring Bumper making it easy for users to calibrate the positioning of the device and the document to automatically achieve straightening or cropping. - 5 megapixel (2592 x 1944 resolution), with native 300 dpi, and up to 1200 dpi enhanced clarity scanner. - Powered by the latest CMOS technology, with large depth of field for documents and 3D objects. - Scan size up to 11" x 14". - Small footprint, with 4" x 5" oval base, 12" in height, and 1.8 lb. in weight. - Retractable aluminum structure with satin finish provides rigid construction and modern look. - Built-in Bright LED Lights.